Structural biology is currently undergoing a revolution: single-particle cryo-electron microscopy (cryo-EM) has recently realized its potential for routinely determining the structures of macromolecules at near-atomic resolution. Through a combination of improvements in the optics of electron microscopes and the electron detectors used for data collection, images now taken in the microscope can provide the information to determine, at high resolution, many new and exciting biological structures. While these technological developments have been critical to cryo-EM’s success, the large amounts of data collected with these new electron microscopes mean that supercomputers are needed to calculate a 3D structure. Typically, researchers must analyze from 50,000 to 300,000+ individual images of a macromolecule in order to obtain its structure at a resolution where amino acid side-chains become visible. This analysis currently requires from 1,000 to 20,000 CPU-hours, which would take between 24 hours and 500 days in a 40 CPU cluster, a normal size for many labs. 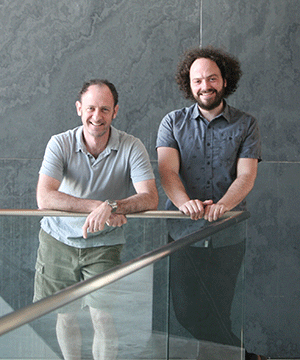 Michael Cianfrocco, a Damon Runyon postdoctoral fellow, and Andres Leschziner have taken advantage of the cloud-computing branch of Amazon.com, known as Amazon Web Services, to provide structural biologists with the computing clusters necessary to make use of cryo-EM’s capabilities. Cloud computing within Amazon Web Services offers its users immediate access to computers housed and maintained by Amazon. By consolidating computer resources, Amazon can offer cost-effective tools that range from scalable website hosting to high-performance computing. Cianfrocco and Leschziner installed cryo-EM software packages within this cloud-computing environment, along with the software needed to create computer clusters in the cloud. This tool allows users around the world to create high-performance clusters, placing cryo-EM within reach of labs that neither own nor do have easy access to supercomputing resources. Cianfrocco and Leschziner tested the performance of standard cryo-EM software packages on computer clusters built within Amazon’s cloud. Their analysis showed that high-resolution cryo-EM structures could be determined for a total cost of $50 to $1,500 per structure. Since Amazon Web Services can be accessed as a ‘pay as you go’ service, this new cloud-computing environment allows users to determine high-resolution macromolecular structures with low up-front costs. This work was recently published in the open-access journal eLife and Cianfrocco and Leschziner have made their Amazon Web Services software environment publicly available. They also created an online tutorial to provide the information necessary to begin leveraging the power of Amazon’s cloud computing network for the analysis of macromolecular structures by cryo-EM.